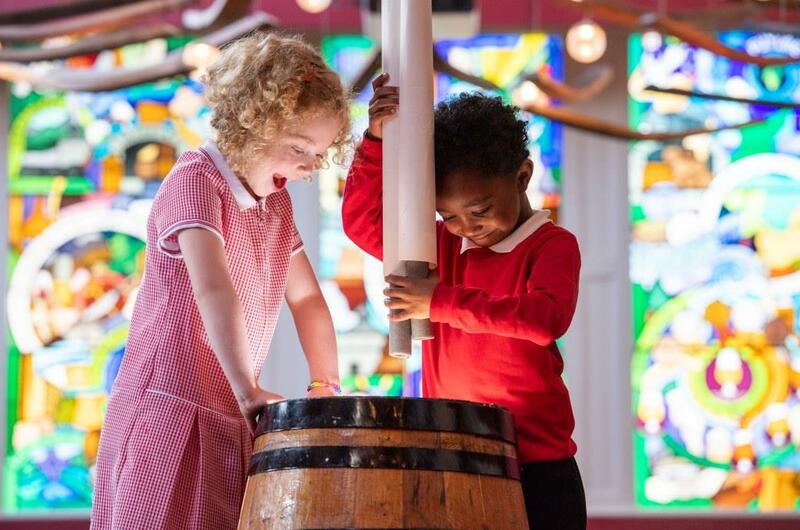 Pupils from Royal Mile Primary School paid a visit to The Scotch Whisky Experience to hide a commemorative time capsule in the attic, marking the attraction’s 30th anniversary. The Scotch Whisky Experience building, at the top of the Royal Mile, was previously Castlehill Primary School, so the primary one pupils contributed a unique piece of work to the time capsule to memorialise what life is like at school today. Encased in a whisky barrel, it will also contain a photo of the 90-strong team and a celebratory message in an empty bottle of an exclusive new 30 year old Scotch, which was released this month by the visitor attraction as part of its birthday celebrations. Two special members of the team – director and general manager, Susan Morrison and head of technical, Dave Wilson, both of whom have worked at the Scotch Whisky Experience since it opened its doors in 1988 – also took part in the hiding activity. The team believe the time capsule may not be discovered for at least another 30 years. Susan Morrison, director and general manager at The Scotch Whisky Experience, said: “This is a huge milestone for us at SWE and we wanted to do something truly special to commemorate, so it was fantastic to have the Royal Mile Primary School pupils join us to help hide our time capsule and contribute to it. In addition to the hiding of the time capsule, a series of other events have also taken place at the visitor attraction to commemorate its 30th anniversary. The bar within the Amber restaurant is currently offering a unique flight of four whiskies, including one from each decade over the last 30 years. This will include Cu Bocan 1988, Balblair 1991, Glenrothes 2001 and Benromach Organic 2010. Constituency MSP Ruth Davidson also visited earlier this month to mark the occasion. Since 2009, the Scotch Whisky Experience has undergone £8m worth of upgrades across all departments, which has included incorporating the priceless Diageo Claive Vidiz Scotch Whisky Collection – 3,384 historic bottles of whisky glowing within a marble and glass vault. At the beginning of this year, the attraction launched tours in British and American Sign Languages – the first attraction in Edinburgh to do so. The addition means SWE now offers whisky tours in a total of 20 languages.